Disclosure: This post is sponsored by Premio Foods. All opinions are 100% my own. Italian Sausage and Peppers is a breeze to whip up. 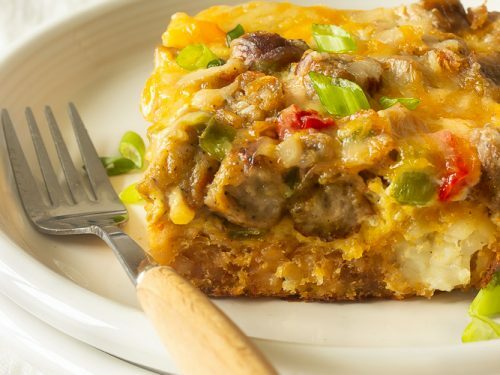 Sausage and peppers make a great trusty and quick weekday meal! 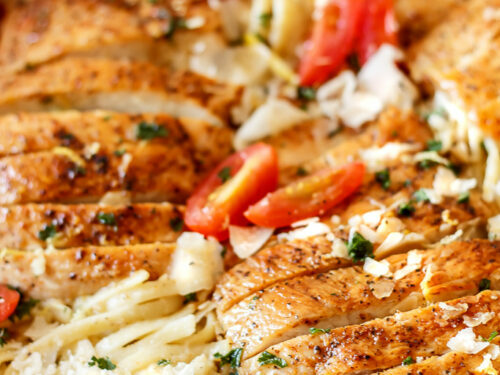 Whether it’s for lunch or dinner, It’s sure to satisfy the hungriest of appetites. Sausage and peppers are my favorite guilty pleasure! I’ve been enjoying this meal since I was a kid. My family would always order our sausage and peppers from this popular Italian restaurant in Jersey. They served theirs stuffed in a hoagie roll with sausages (of course) potatoes, onions and lots of peppers. My mom would cook sausage and peppers served on sub rolls. It was seriously the best hearty meal ever. 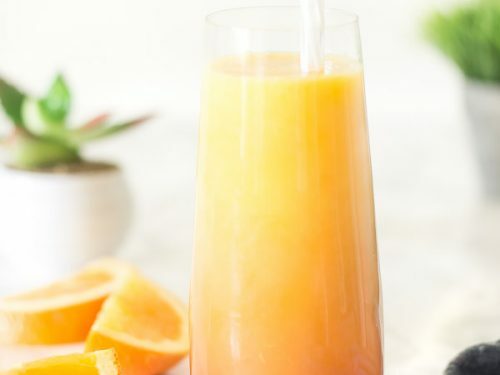 This recipe brings back so many childhood memories. I’ve passed on the tradition and now I serve it to my family. 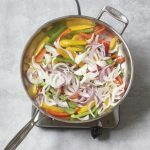 Italian sausage and peppers are combined with fried potatoes, oregano, basil, crushed red peppers, onions, colorful peppers such as, red, yellow and green bell peppers. I used healthy chicken sausages but you can use whatever sausages you like. 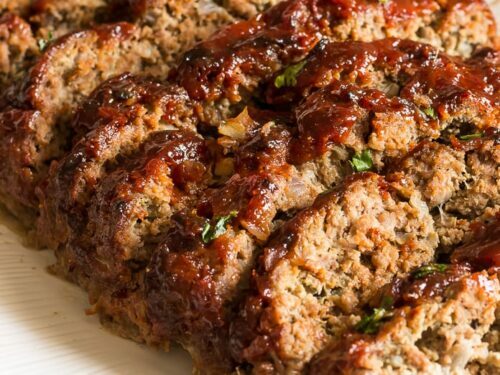 It’s very hard to find a flavorful chicken sausage that actually has the same flavors as the pork ones! However, I kid you not, I found one and they’re made by my friends over at Premio Foods. They also carry pork sausages and a wide range of other great sausages. Check it out HERE. I used to purchase their pork sausages years ago when I used to enjoy pork way before I became a blogger. Back then I would have never thought that I would have the pleasure of working with Premio Foods. But let me tell you about these Italian chicken sausages. Perfect for people on a special diet. They are much lower in fat than pork sausages, they are SUPER good! I’m not saying this because it’s a sponsored post. 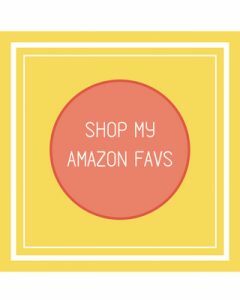 If I don’t love a product, you won’t see it on this blog. 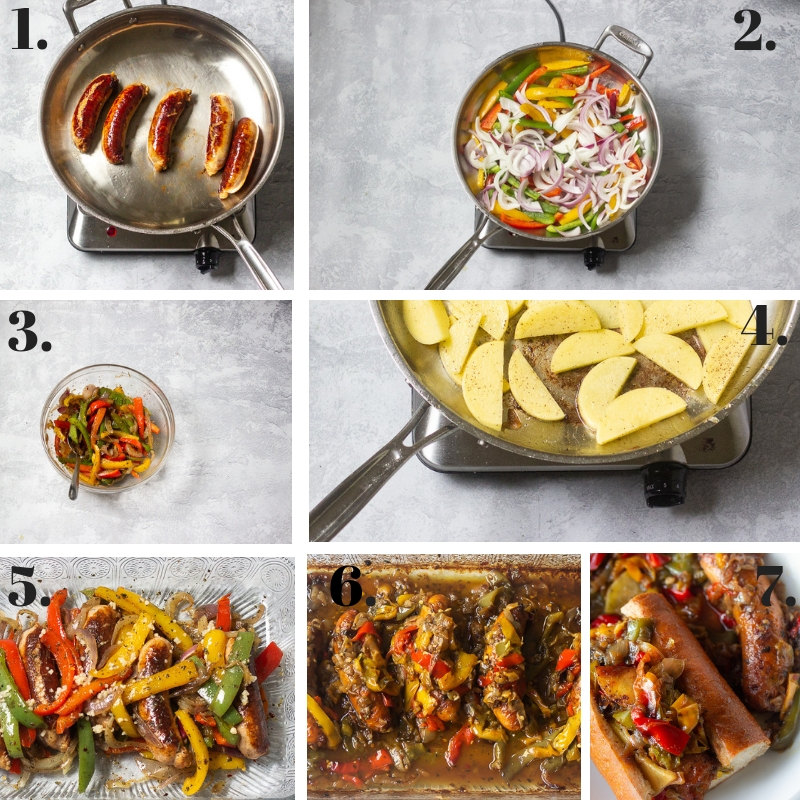 Now you can enjoy sausage and peppers but in a much healthier way. To be honest, when Premio told me about their chicken sausages I was a bit skeptical. I never had a REALLY good chicken sausage that wowed me. However, I was blown away at the first bite! Perfect snap, HUGE flavor, crisp and so juicy. They are my new favorite! I’ll be getting rid of my sausages and replacing them with Premio chicken sausages for now on! 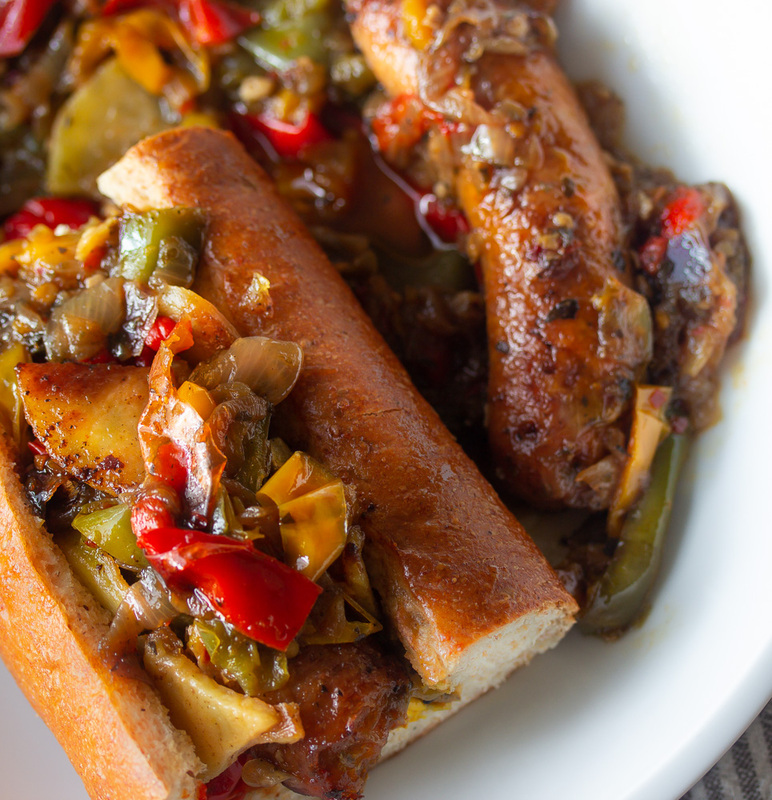 You can never go wrong with sausage and peppers. 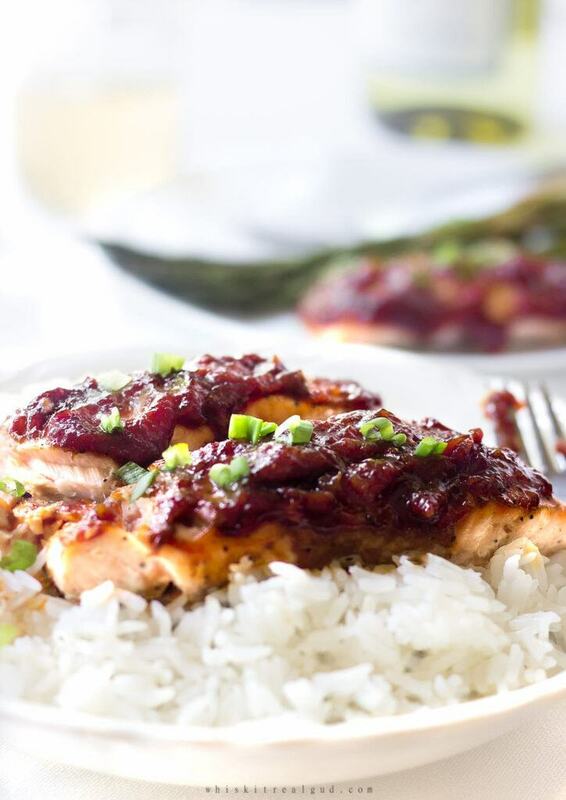 It’s a simple, inexpensive meal with BIG flavor. Just sear the sausage and saute the veggies. Secondly, season the veggies, thirdly, place everything in a baking dish and cook until it’s done. I took two approaches to make this Italian sausage and peppers. First, the oven approach and then the slow cooker approach. 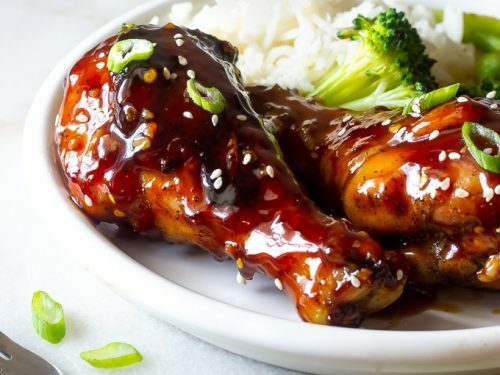 This recipe is perfect whether cooked in the oven or in the slow cooker. The slow cooker is great option for sausage and peppers if you want dinner done when you get home from work. Just cook on low for about 4 hours or until the sausages are very tender. To achieve the slow cooked flavor in the oven (perfect if you don’t have a slow cooker) just cook the sausages for about an hour and 20 minutes on 325 degrees Fahrenheit. 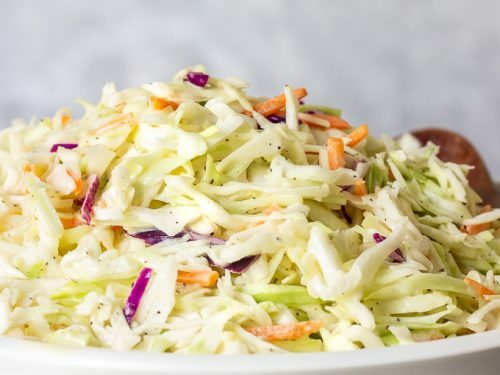 It’s a great quick meal to serve for parties or during the super bowl or any game really with a tall cold glass of beer. Make a huge batch in the oven or the slow cooker. 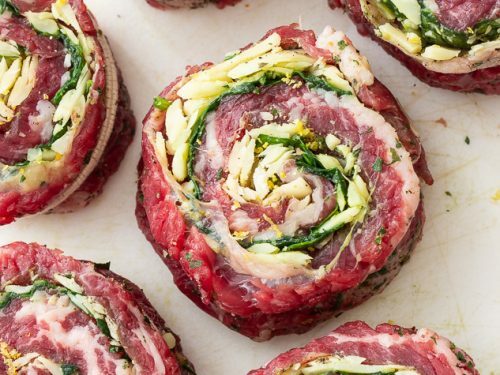 Serve them in hoagie rolls then slice them to make smaller proportions, or you could just serve them whole with ketchup and mustard. This has got to be the most easiest recipe ever. It’s so easy to make even kids old enough to cook can make it! First, preheat the oven to 350 degrees F. Then slice up the peppers and onions think or a bit on the thicker side. I prefer my peppers to be on the thicker side. They will cook down a lot so don’t make them too think. Secondly sear the Italian sausages until browned. I like to make mine very brown as you’ll see in the pics below. Thirdly sear the veggies until softened. You can definitely sear the veggies first if you like though. Season the pepper and vegetable mixture with basil, oregano, crushed red peppers, salt and pepper. Optional, Fry the veggies next. Adding oil as needed. Fourthly, add the peppers and veggies mixture to a baking dish. Spread them out. Top with the sausages. Place the excess peppers on the sides of the baking dish on top of the peppers. Fry the potatoes until golden and crispy. 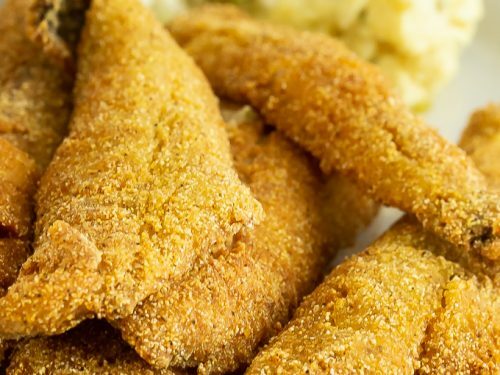 Don’t worry if about trying to get them all crispy. A combo of soft and crispy potatoes is what you want. What sides go well with Italian Sausage and Peppers? 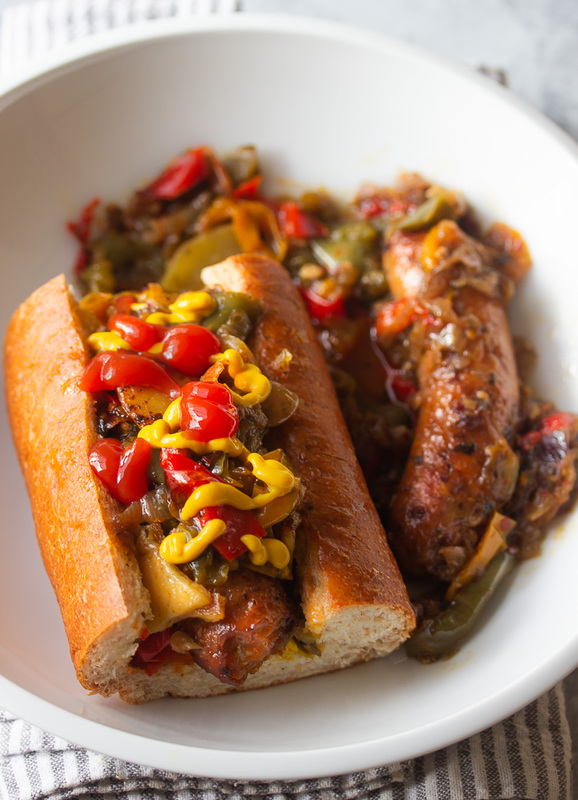 This is the only Italian sausage and peppers recipe you’ll ever need. It’s just soooo GOOD! 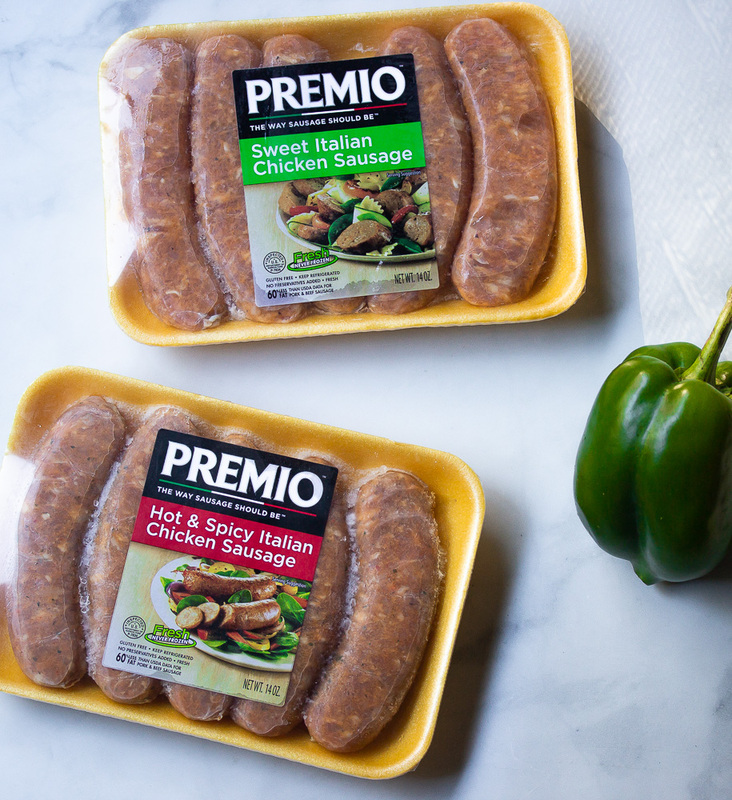 Don’t forget to stop by Premio Foods and check out their GREAT selection of sausages! Preheat the oven to 350 F. Heat the olive oil over medium heat in a large pan. Once the oil is hot add the sausages. Cook until all sides are seared turning them occasionally. Set to the side. Add more olive oil if needed to the same pan. Over medium high heat add the onions and peppers. Toss to coat them in the olive oil. Add the minced garlic. Saute the vegetable until slightly browned and softened. Season with the basil, oregano, crushed red peppers, salt and pepper. You may want to do this step 15 minutes before the sausage and peppers are done cooking. Heat 1/4 cup vegetable oil in a skillet on high heat until it's it's almost smoking. Add potatoes, and turn over every couple minutes until brown. 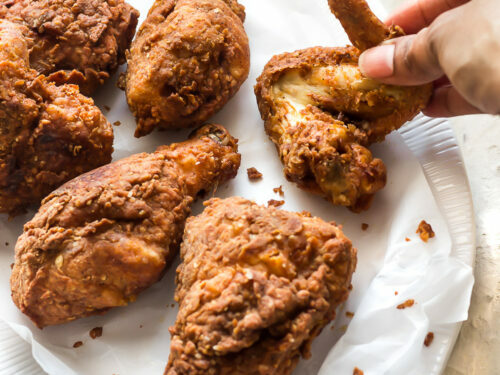 Don't worry about trying to get them all crispy. A combo of soft and crispy potatoes is what you want. Cook until the potatoes are cooked through. Lightly season with salt and pepper. Add the seasoned peppers and onions into 9x13 pan. Scatter. Add the seared sausages on top of vegetables. Take any excess veggies from the sides and tops of the dish and place them on top of the sausages. If you didn't add the minced garlic yet do so now. Add the minced garlic on top of the veggies. Cover and bake for one hour. *See notes for slow cooker. Remove the foil and bake for an additional 20 mins. 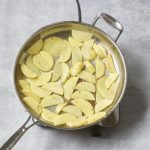 Serve hot with the optional sliced fried potatoes. Stuff a couple of potatoes into the hoagie or whatever roll you decide to use. Add the Italian sausage. Add the peppers on top of the sausage. add two more or so of the sliced fried potatoes. Top with ketchup or mustard or add both. Enjoy! 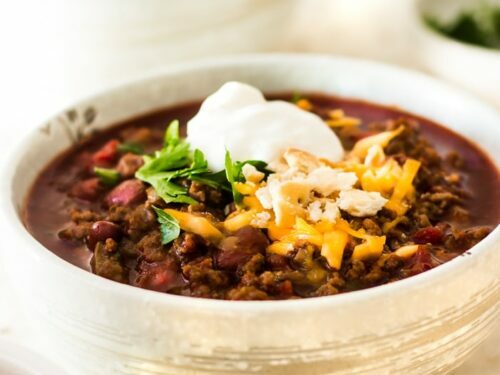 This recipe can be easily adapted for a slow cooker. Follow all the instructions up to baking. Cook the Italian sausage and peppers on low for 4 hours or until the sausage is very tender. Sausage, peppers and onions reheat very well. They keep well in the fridge for several days. 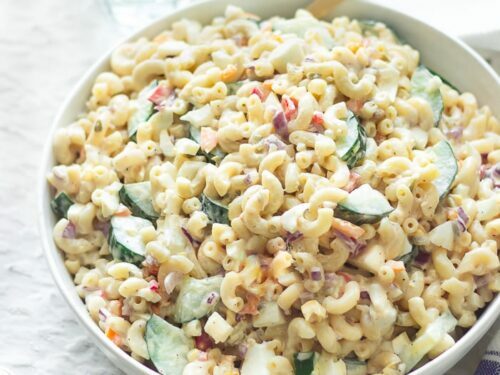 Any leftover is great with pasta and a sprinkling of parmesan cheese. Read the body of the post for side ideas. 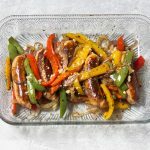 If you like this Italian sausage and peppers recipe, make sure to save it to your Pinterest Board and follow me on Pinterest where I pin DELICIOUS drool worthy food. 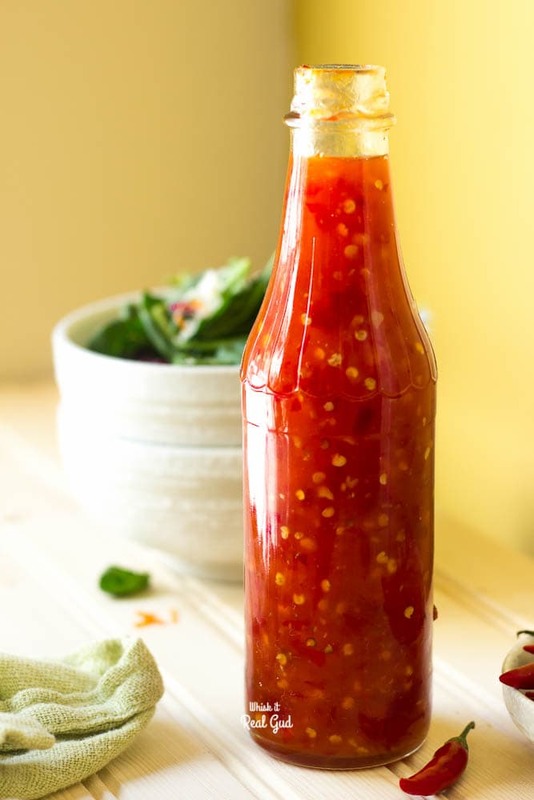 You can also bookmark this recipe by sharing it on your Facebook. 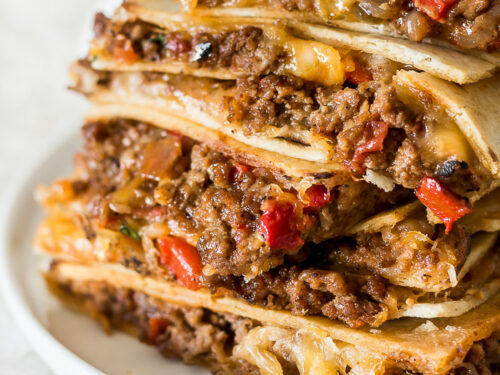 If you know someone that would enjoy this recipe make sure you share this post with them! 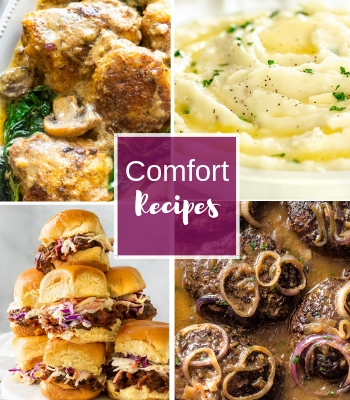 Check out some of these other favorite and popular recipes! This looks so wholesome and hearty. 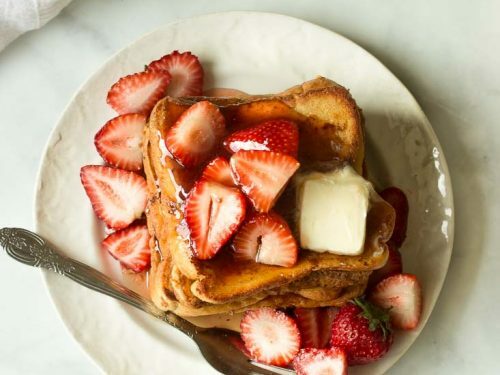 I love such simple and delicious recipes. Italian sausages are already so flavorful so this must have really been a treat. Million dolla, make you holla!! The colors on this are so good. I want to lick the screen! I love Premio and your sausage and pepper subs look fantastic! I want to reach into my screen and grab one. Now I have a big craving for sausage and peppers. I haven’t made it in a while…I need to soon! The sausage looks perfect and the peppers look delicious. 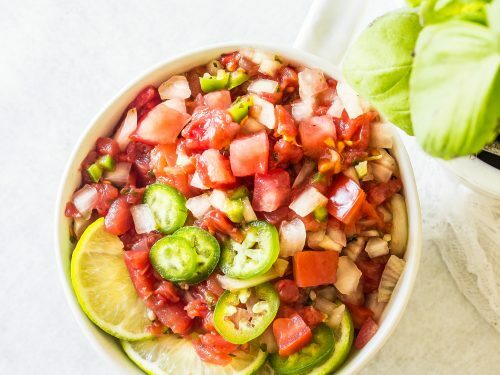 I haven’t made sausage and peppers before, but this looks so delicious and I think I need to give it a try! Wow, this is a unique recipe. I would like to eat it for breakfast lunch and dinner. Or it would have been my perfect sandwich. I can not wait to try. You are a genius! The recipe looks really delicious! Thanks! Growing up my mom would make something like this, but she never put it on rolls. I love this idea and what beautiful photos! Thank you so much! It’s hard to find a good chicken or beef sausage these day! It’s my new go-to sausage! 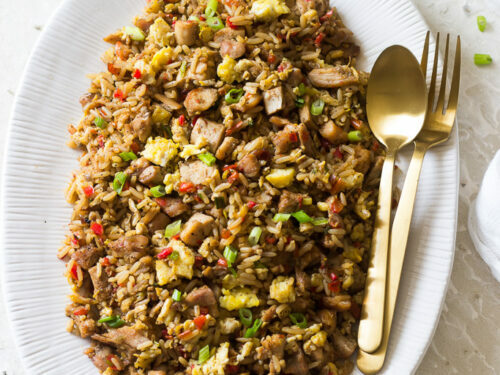 This looks like a really hearty dish and would be perfect for the colder weather to enjoy. Thank you so much Nayna! 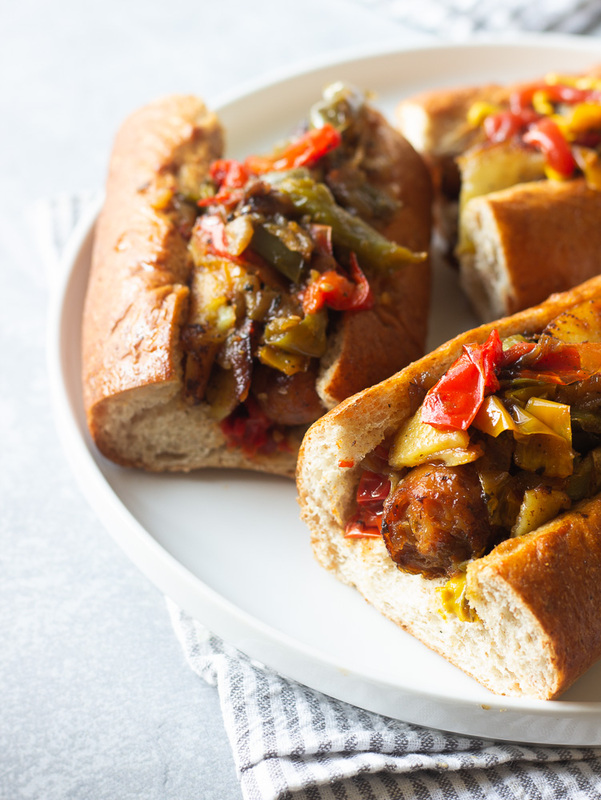 Mmm…Italian Sausage and Peppers reminds me of our county fair growing up and that’s a good thing! I remember walking past, smelling them always made me hungry, even if I just ate. 😋 Thank you for this recipe. My family will love it. Thank you so much Nelle! My dad loves sausage and peppers so I can’t wait to make this for him. Also loving that this sausage is chicken. Such a great healthy alternative. 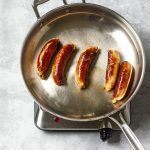 I love a good sausage but ever since I stopped eating pork, the chicken and beef sausages I’ve tried have been pretty underwhelming, that is until I found out about Premios Foods chicken sausages. They are fantastic! 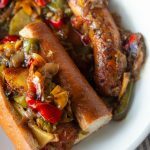 I never would have thought about cooking sausage and peppers in a slow cooker but it totally makes sense! I usually make a similar dish stove top but with hockey season and practices in full swing I am going to give the slow cooker option a try. Thanks for the idea! Thank you Alisa! The slow cooker would be a great option. It’s a great way to feed a crowd. We love the “hot & spicy” kind in our house. 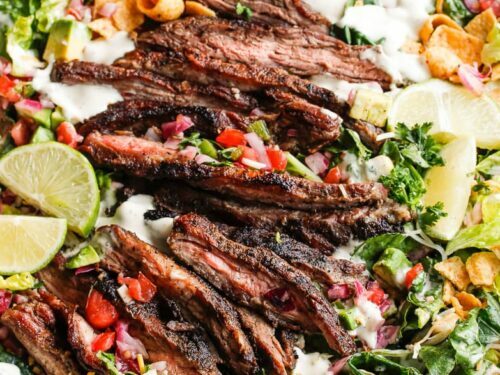 This would be a fun meal on the weekend…and leftovers would be great for another meal. 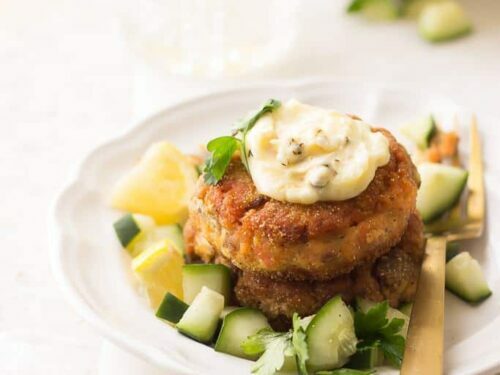 This is a fun switch up from regular burgers and sandwiches too. I agree Gloria. I actually love this better than burgers. My husband loves the hot and spicy kind. I like to mix them both up. I was agonizing on what to fix for dinner tonight!!! Problem solved…Heading to Sam’s now for Premio Sausages and hoagie rolls!!!! Premio sausages are very good! Their chicken sausages are the most flavorful and juiciest chicken sausage I’ve ever had. I literally stopped to check the ingredients because I thought I used pork instead of chicken. Thank you so much and I hope you enjoy it! Ohh my goodness that is upping the hot dog game for sure! It looks absolutely delicious and droolworthy. Those sausages look good too! That sausage looks amazing! 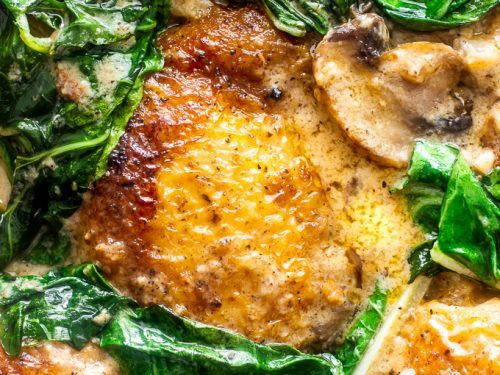 You perfectly browned the outside, and I love the idea of serving this with grits or polenta. 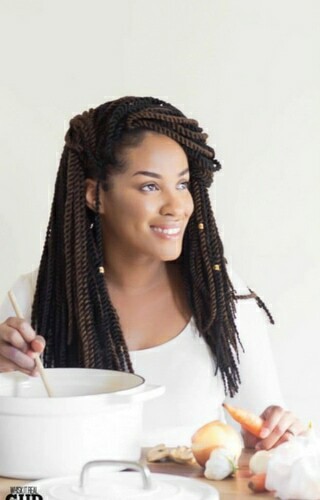 Definitely making this soon. Thanks so much for sharing!